There is a hip hop MC from Chicago who is creating a buzz in the underground hip hop scene. 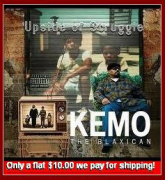 The MC whose name is Signs, who is also known as Afro-Amero, grew up in uptown Chicago for about ten years, and then he was sent to his parents’ native home town in Nigeria in June of 1996. During his stay in Nigeria, this young hip hop MC learned and discovered the history of the African culture and acquired knowledge based on his African roots. Being a young man in hip hop the first thing that surprises the listener is the depth of his music. Some would say that Signs is deeper than just a rapper. His knowledge and wisdom shines thru in his music and his tracks are filled with a uniqueness not often found today in young hip hop artists’ writings. Signs returned to Chicago in early 2002 and began to mature in both his music and his writing skills. This overlooked MC is making a mark in hip hop with his unique style of writings and his exceptional writing skills and life experience. As a young man Signs has the making of what hip hop is longing for and with his dedicated attitude and work ethic; this young hip hop MC from Chicago via Nigeria will certainly catch your ear. Check him and his music out at http://www.hiphopdirectory.com/music/bands/6/ . MC Signs latest single A.F.R.I.C.A. and more of his tracks are also in rotation at www.TLARadio.com for internet radio listeners. MC Signs will announce upcoming show dates and the street date for his mixtape soon. Check him out and see what all the buzz is about and see for yourself it is just not your normal hype – this is a stand out young man whose fate is to be noticed in the field of rhyme.